Gorgeous George is coming to Vintage Festival 2012! No not Clooney – this is our Gorgeous George, with Ruby…..and he is coming to Vintage 2012. George is a fully restored 1972 Volkswagen Beetle and he will be on show for the whole of the festival at Broughton House, 13th – 15th July. Come and see him and us there. Our preparations are well underway for the festival; we are frantically getting stock ready for the show – lots of Retro phones, clocks, lighting, record players, homewares and maybe the odd radiogram if we can fit it on the stall. As we are based near to the show, we will be changing and adding stock daily and can we deliver locally. Visit the Vintage 2012 site for full details of the festival. The first ‘Vintage Nation’ one day festival was held at Brighton Racecourse in early June and thankfully the rain managed to hold off for the whole day. The Venue was great and we had the Paddock Box where we set up a whole shop, with help from Lesley of Retropolitan. All this for a day! Mad I know but it looked great. See the pictures on our Pinterest page. Sold lots of stock and met lots of lovely vintage folk. Big sellers were luggage, lighting, homewares and the obligatory radiogram. Didn’t get home till 3am – but definitely worth the trip and looking forward to next year. 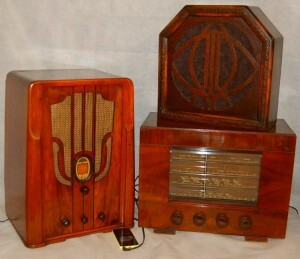 Wow a Radiogram on the Website! At last one of our fabled radiograms has actually made it to the website – mainly because this one is so good we wanted to share it with everyone before it sells. It’s a Vintage Marconiphone, Model 4304 from the 1950s. Not only an iconic piece of furniture of the period, but a fabulous piece of Vintage technology AND adapted for any MP3 player! Finished in highly polished teak veneer, with tambour roller doors to the front, and speakers covered in stylised black & silver atomic period material. It stands on ebonised legs, which are removable for easy transportation. This gorgeous piece of Vintage chic has been given a comprehensive service and is fully working. Click here to see it in all its glory. The Retro Bazaar website has just celebrated its 18 month birthday and we have added a lot more stock – including some fab vintage furniture and lighting. We try to add new stock each month so go to the ‘Just In’ section to see what’s new. We ship worldwide and accept payments via our secure card payment system, PayPal, cheque or cash. We use couriers and the post office to send out our stock and you are also welcome to come to the unit to collect any purchases. Also if you want to buy a large item off the website you can pick it up at one of the shows we are attending. At the end of May we will be back in York Hall for the Bethnal Green Vintage Fair on the 27th. In June we are attending the Vintage Nation Festival on the 9th and the Grantham Antiques, Vintage & Design Fair on the 19th& 20th. July is the big one, with Vintage 2012 Festival on the 13th – 15th July at Boughton House, Nr Kettering, Northamptonshire. Find us in ‘The Vintage Marketplace’. We will be bringing a selection of our fab phones, lights, furniture, clocks and homewares to these shows. Full details can be found on the events page of the website. If you are interested in the day-to-day musings of the Retro peeps you can follow us on Twitter, friend us on Facebook or Pin us on Pinterest. We tend to chat about new stock, shows we are attending and general things we find interesting and fascinating. We also upload lots of gorgeous pictures to whet your appetite! So come on – click the links! With the recent re-emergence of vinyl, record players and radiograms are back in vogue. These necessities of late 20th century living, which up to recently were unloved, are now required purchases for the vintage fashionista. 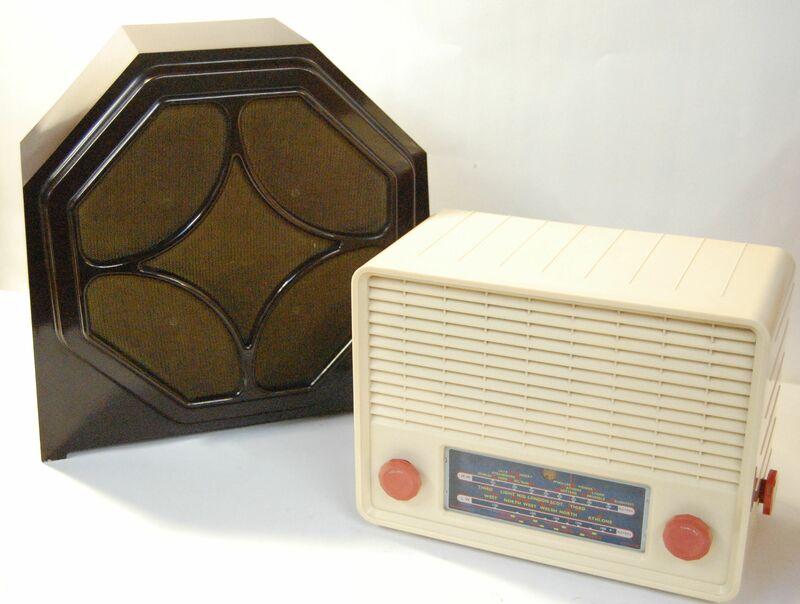 And never one to miss a trend, here at Retro Bazaar we restore and refurbish record players and radiograms – with an added kick – we make them MP3 compatible. So now it is possible to listen to your much beloved vinyl records and your new downloads on one stylish piece of retro loveliness. So why are there none on your website, I hear you cry? Well basically as soon as they are ready we take them to a show… and they never come back. We always sell them. If you want to catch one of these lovelies we will be bringing radiograms and a Dansette record player to Bethnal Green Vintage Fair on 27th May. See you there! So what retro or vintage lover wouldn’t want a fabulous dial telephone in their groovy pad. From 40s & 50s bakelite beauties to the much loved GPO phones of the 60s and 70s and push button phones of the 80s – we sell them all AND they work! Now I appreciate that you won’t be able to use these phones for telephone banking, but you will get a stylish addition to your hall or sitting room, very loud bells, plus you can’t lose it as its plugged in! Who wouldn’t want one. Have a look at the website for the full selection – plus we can make the dial label for your number too!